Are you looking for the best responsive WordPress theme? You’re at the right place. In this article, we’ve picked some of the best responsive WordPress themes for you to choose from. What’s the use of Responsive WordPress theme? This theme automatically changes its layout and format based on the size and resolution of the screen. WordPress is an effective tool around that many small business owners and individuals use for creating a website to reach their target audiences. It allows doing a lot of things with your site even if you don’t have the knowledge of HTML or CSS. WordPress allows developers to create plugins which can unify the different services you use to reach your target audience. There are different categories of WP themes like Free WP theme, Sensitive WP theme, and Paid/Premium WP themes. Each theme has specific features which are easily customizable and adaptive for any purpose. Finding the best responsive theme is a challenging task, that’s why we’ve put together this list of 10 Best Responsive WordPress Themes that you can consider to your own website. Divi is a drag and drop WordPress theme and the page builder which offers unlimited customization features and superior functionality. What is the Divi Theme? It is one of the most popular multi-purpose WordPress themes on the market. Divi helps you create your dream website. Divi comes powered with Divi builder which allow you to create elegantly designed Divi blog layouts. It is easy to blend with your own needs WordPress theme by elegant themes. Besides all the premade layouts and elements- what makes Divi Theme special? It’s a real-time live visual builder theme, the frontend of Divi builder was built so that you can change text and elements on a live website. It’s quite easy to change the text, fonts, colors, and even add images and drag page elements around. Use the builder to create all of the content that fits inside the header, footer, sidebar framework that you choose. Launch Divi builder by clicking Use the Divi Builder button inside any post or page. Divi gives you the option to choose either whereas many page builders only offer one or the other. Is Divi Theme SEO Friendly? Yeah, Divi Theme is 100% SEO friendly. Divi has all important SEO features which a WordPress theme should have plus some more. Some of the features that make Divi SEO friendly are better site structure, canonical URL feature, as well as features to add Meta titles and descriptions etc. 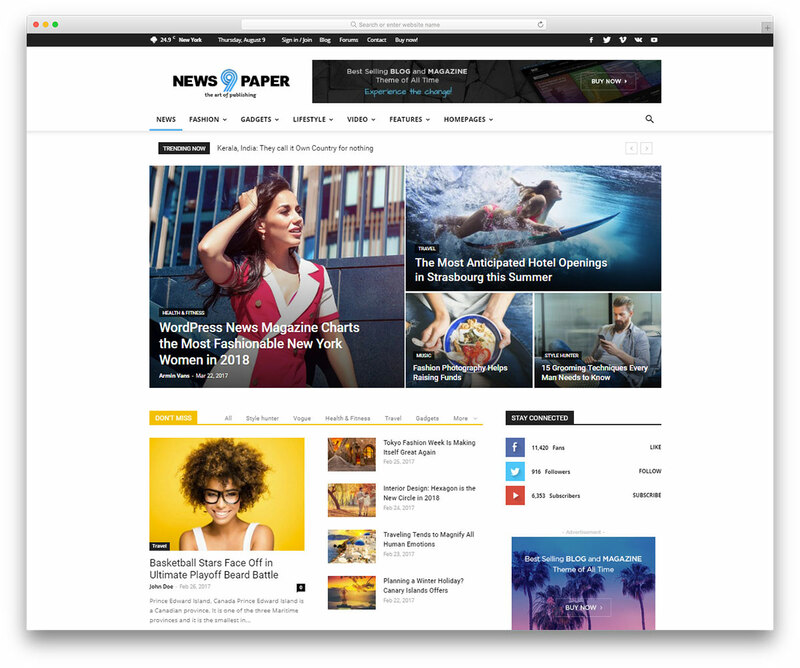 A newspaper is the best WordPress theme developed for blogs, articles, magazines, and news-based websites. The Theme is fast, simple, and easy to use and you’ll love. The tagDiv composer builder allows to drag & drop over 100 elements to create amazing pages. A newspaper is now considered as a multi-purpose WordPress theme because previously the demos in Newspaper package were built for creating blogs, magazines, and other content-focused websites. Now there are wide ranges of demos like online portfolios, dental studio sites etc. One of the great features of Newspaper theme is the custom built tagDiv Composer page builder tool. It’s specially built for magazines, news, publishing websites, and comes with multiple elements to ensure each article has a right look. Newspaper Theme is designed with a responsive and retina ready design; it also includes a new feature called “Mobile Theme” that offers you the opportunity to display the same content in two different ways, one optimized for desktops, and other for mobile. This theme was created to help you write articles and blog posts with ease. Here are incredible features for a high-quality browsing experience from all types of devices. Now it’s easy to make each website unique! will definitely make your digital experience smooth and great. After recent updates, Newspaper has a number of new demos that can be used for a wide range of websites. The latest version comes with the tagDiv Cloud Library and it has 420+ pre-built templates for posts and pages that can be easily imported with a click and customized on the front-end of your website. Do you look for a feature-rich multipurpose theme for your website? Uncode is one of the pixel perfect WordPress themes which comes with a lot of built-in homepage templates, let’s have a detailed look at the functionalities and determine whether it’s the best choice for your site. The theme is built with Visual Composer, which is a popular page builder plugins with frontend and backend editor. Uncode lets you create an outstanding website and allow to pick from over 30 homepage designs. With a single click, it’s possible to import all the content from the demo site by using the Install Demo Content Option. An uncode theme has a powerful page builder tool, that’s why you can create custom layouts and designs for your website’s pages. It is installed and activated just like a normal WordPress theme, simply upload and activate theme package through Dashboard or via FTP then you’re ready to start! There’s a wide range of uniquely styled pages which are highly customizable, only with the help of Visual Composer. The Theme has a Theme Options Panel in which you can make your own changes. This multipurpose WordPress theme comes with 24 different demo styles that allow you to create any kind of website. Uncode is a fully responsive theme, with its Adaptive Images System it’s possible to automatically match the screen size of a device to make the screen size fit a device perfectly. It allows you to embed any third-party multimedia content on your site. There are tons of fonts available you can also add Google Fonts to your site. With the multiple grid options, designers can create whatever layout they want specifically with spacing, margins, design elements, and content positioning. As I said above, with a single click you can easily import demos and pre-built page at any given time without the need to import unwanted pages. 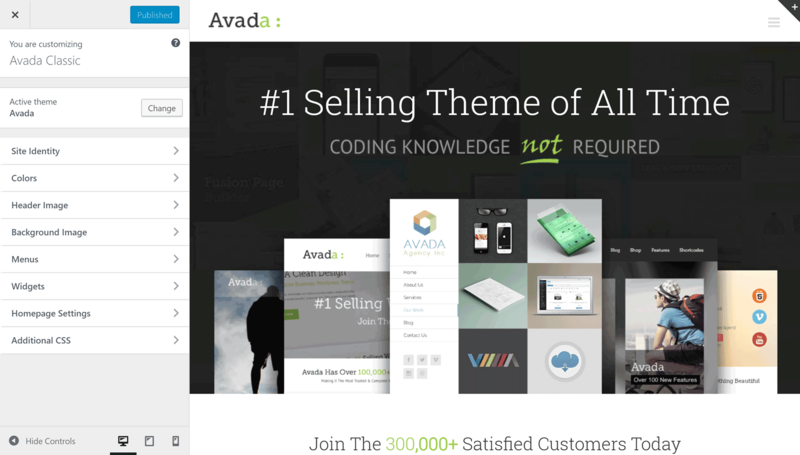 Avada Responsive Multipurpose Theme is the best selling WordPress Theme, Why it is popular? Avada is user-friendly, versatile, and also ideal for a variety of purposes. Clean, modern, and friendly designs are organized and intuitive to use. These features make Avada an extremely flexible theme. Do you need a stunning website? Sliders are the best method for that, there are four types of slider extensions as you all may know about it. This is most popular for WordPress as it features a drag and drop slide builder that is amazing and comes with support for 2D/3D transitions. It has some options like full-width sliders, thumbnail navigation etc. The slider is fully responsive with touch gestures for mobile users. This Plugin is user-friendly which helps to build slideshows that are completely responsive. This plugin works great for simple images with subtitles, a slider is both responsive and stunning. Titles and subtitles come with a neat animation whereas navigation thumbnails are paired with the popup. It’s a robust plugin that features a drag and drop, making it easy to create slideshows. You can include HTML, images, videos, images, texts, and other elements. Avada is flexible to design and easily customizable. Among four sliders, Fusion slider is a lightweight, powerful drag and drop visual page builder. A bridge is definitely feature-rich WordPress theme which has a collection of 370+ demo sites so it’s a flexible theme. A bridge is a multipurpose WordPress theme available from Themeforest marketplace. Like many premium WordPress themes, Bridge also comes with loads of features. The major benefit of these layouts is customizability and you can change anything using built-in tools. Actually, Bridge is a multi-purpose theme so it comes with more than 100 unique demos with their own design and content. With Bridge theme, you can easily create a website exactly like the demo by just a single click. Design and demo content will be installed on your website. Bridge theme is the best premium WordPress theme which gives you the full control on how you use the background images on the website. You can either use a full-screen background image or use a large image by customizing the header. It’s possible to add Parallax layers on your page which makes the page interactive and engaging. Bridge theme has two premium WordPress plugins which are Visual Composer and Layers Slider. As we all know that Visual Composer is one of the most popular drag and drop page builder so you can easily create any kind of page layout. Layers slider is another WordPress slider that allows creating beautiful image sliders, video sliders, and 3D effects. Bridge gives complete control of the design process and provides multiple ranges of options that obviously allow to quickly and easily customize any aspect of your website. There are numerous theme panel options, a selection of premium plugins, and access to drag and drop front-end page builder. TheGem is a newly developed multi-purpose WordPress theme; also it’s an excellent choice for experienced developers who are looking for a faster way to produce a professional website for their clients. TheGem is perfect for every kind of website as it has more than 100 different templates which will fit in all cases. It’s the best SEO WordPress theme 2019. You can also customize your posts and pages with a large number of elements, blocks, columns, frontend, and backend with drag and drop functionality given by the Visual Composer page builder plugin and TheGem shortcodes. Visual Composer is one of the excellent drag and drop page builder tools available for WordPress. TheGem also includes two premium slider plugins: Slider Revolution and LayerSlider these can be used to create advanced slideshows and presentations for your WordPress website. 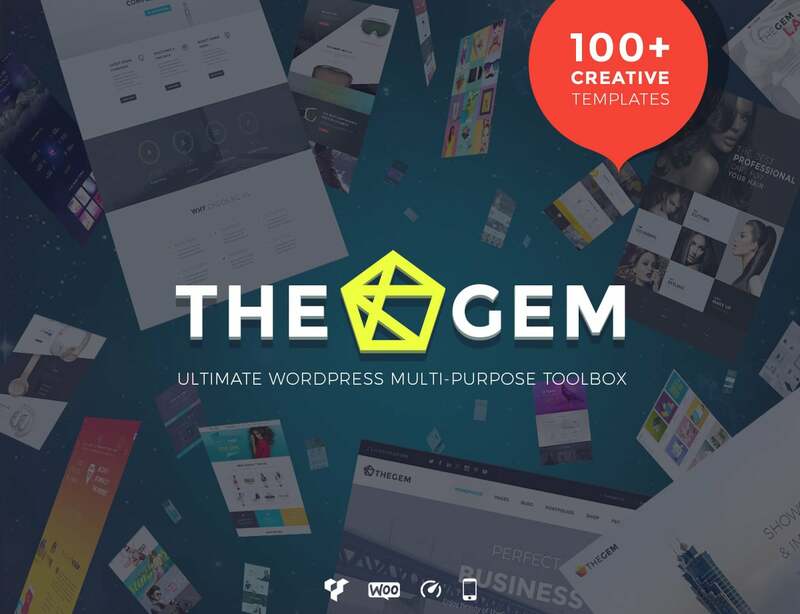 TheGem was designed to help you build a professional website with creativity and style. This theme is responsive and retina ready which allows you to choose your page layout. TheGem has a custom plugin which helps to import the demos on your site, and there are over 40 pre-built designs. Its back-end theme customization settings give a good amount of control over your website. So, it’s easy to customize many of the website’s settings through the backend theme options panel. Flatsome is one of the highly customizable themes which include a user-friendly visual editor that allows you to design your pages and posts from the front-end of your site. 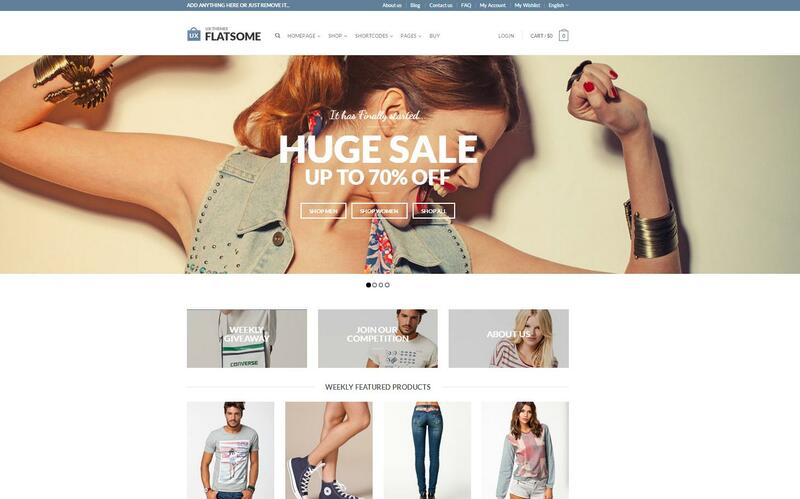 Flatsome is one of the fastest themes on the market; therefore this theme can offer your customers incredible user experience. Flatsome is fully responsive so your site looks great, this will definitely help you increase conversions and make it possible for potential customers or buyers to order your services. Flatsome has a custom-built system of activation; you can install plugins and pre-defined pages from welcome activation panel. How does the template help you to create a better design? The template helps you implement mega menus, sticky menus and give customers a chance to review the products you’re selling. Flatsome has a Live Search option which makes it easy for the customers to find the product they want. With this option, they can instantly view the results and click on the product that catches their eye. The Flatsome theme now uses UX Page Builder which is easier to use than Visual Composer. With this builder, you can add rows, columns, and various blocks to your posts and pages as well as your product store and checkout pages. The flatsome theme comes with a built-in header and footer builder so it’s easy to customize and make it relevant to your website. The customizer panel of Flatsome is structured with ten subsections which gather options for the header, layout, homepage, footer, pages, and other elements. Before, Flatsome customize pages only from the backend. Now the developers have included the front-end drag and drop page composer, which is UX page builder that uses a friendly system. Another new feature is the possibility to create sliders and image grids from the page builder, without installing any additional plugins. 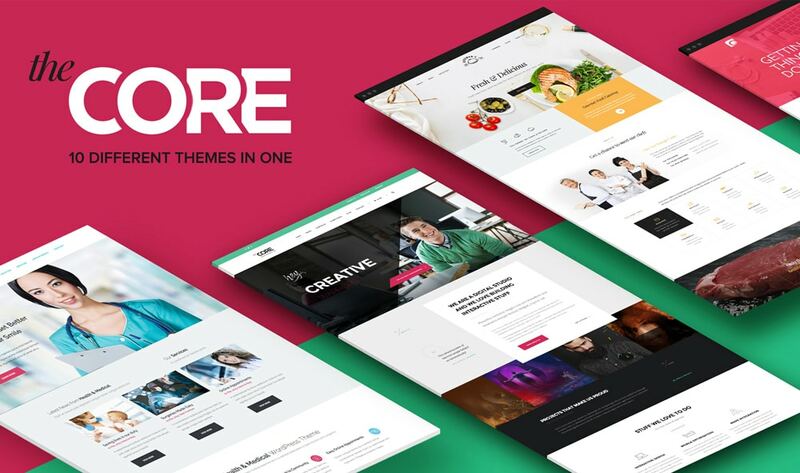 The Core is a Multipurpose WordPress Theme from ThemeFuse that can be used to build a wide range of different websites. The Core theme has a lot of demo sites which can be applied to your WordPress website in just a few clicks. This makes the theme a highly flexible tool and a true multipurpose WordPress theme. It’s very easy to install, once you’ve installed it presents you with the set of options. You can also install the recommended demo content and various plugins. The Core is specially powered by the Unyson Framework which has built-in extensions and functionalities that will help you to build your site. There are plenty of tools available in Unyson like Page Sliders, Sidebars, and Sliders and so on. The Core is a fully responsive theme which means users can get a better experience on any screen size or device. The retina ready option makes sure that the content is readable and appears beautifully on any mobile screen. The Core has a rich Theme Settings Panel as it gives you the flexibility and customization options for your site. In General settings, you can get complete control and flexibility just to adjust the width of the website. It’s possible to set the top and bottom margins, adjust the orientation of the site as well as choose a container background color for your site. At this category, you can add your social links which will automatically get added to your website. Here you get to choose the page header, height, header image, header image overlap, title, and content position. The Header area is very important for a website as it has the ability to build the site’s personality. First, it’s better to select the Header design type and then choose the Logo position, dropdown bg color, background color etc. There are also options for turning on or off features like a boxed header, absolute header, search bar, sticky top bar, and so on. The theme supports footer widgets, and it’s possible to toggle them on or off. Then choose a number of columns of the footer area as well as the background style of footer area and widget area. Soledad is a flexible and robust multipurpose WordPress theme which is truly versatile and effortlessly fit for any type of website. There are numerous pre-made demos which are good for building magazines as well as blog websites. It’s the best choice for people and businesses who are looking for a complete solution for setting up a website. The website created by this WP design tool doesn’t look like WordPress sites. They look modern and fully-functional websites designed by experts. 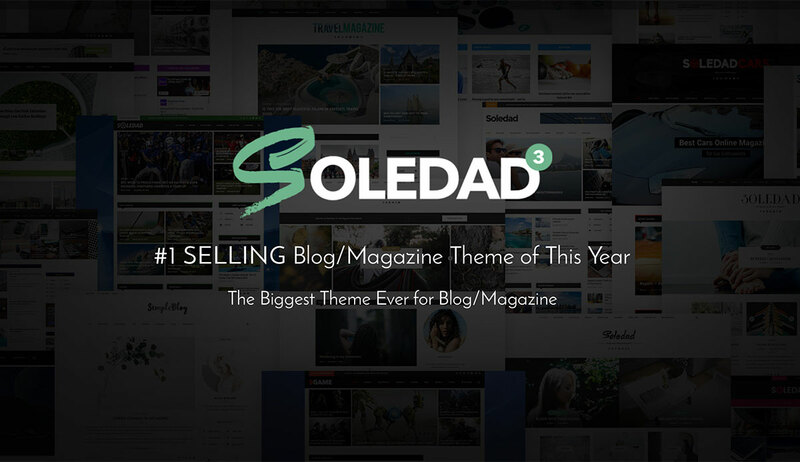 Soledad comes with two mega menu styles, three sidebar layouts, and templates which allow creating eye-catchy pages & posts with distinctive typography. Soledad comes with 250+ demo homepages just to offer you the easy and quick setup of your website. If you love to modify your website to fit your imagination then there are 200+ sliders and layouts combination. Soledad allows to both enable and disable your options in real time, through the Theme Customizer all the changes can be seen on the page’s right side. This customizer has 34 tabs with various customization options, right from social media, colors, footer options, and other General options. The theme comes with eight free optional plugins recommended by Pencidesign developer. Some of them are Portfolio, Slider, and Penci Recipe which brings additional functionality to this theme. The Demo importer plugin is one of the useful tools that allow you to import 40 theme demos and create a website for your personal needs. Visual Composer has 72 different elements that can be automatically inserted into rows and columns on your page. X Theme is one of the best WordPress Multipurpose themes with ultimate flexibility that can be used for various purposes to create different types of websites. It’s a feature rich theme, with options that hand you the power to create, manage, and scale your site as per your requirements. One of the benefits of this theme is it comes with a pre-designed page layout as well as ready to use demos to create your website within a minute. Stacks are unique layouts that help to create a unique design, in this X Theme there are four stacks. What’s the use of stack? They work tremendously also they’re easy to customize. Each stack gives you a different layout and design choice to choose the best. Just adjust according to your requirement and see the changes. X Theme has another unique feature which is called extensions, it is made specifically for X theme. Just download and install them into your WordPress site. It’s a powerful front-end page builder which allows users to work on their website directly on the front-end. There are plenty of shortcodes that you can use with your X theme. It also comes with some unique shortcodes that allow to create buttons, add different design elements, icons etc. When you choose an SEO friendly theme it really makes a difference, it also allows integration of the best SEO plugins like Yoast SEO into your WordPress website. Even the free version of SEO plugin can help you keep your content optimized and there are chances to rank in the search results that bring you organic traffic. A multipurpose theme will make your website unique also it offers several layouts to choose from, including personal blog pages and advanced e-commerce stores. Look at the few key benefits of using WordPress to run your site. WordPress is mainly designed to support blogging yet it also powers a wide range of sites with other purposes. These sites can contain full-service eCommerce stores, host a social network, group, or podcast. A WordPress site can be easily installed; it doesn’t need any technical expertise so all a user needs is a domain name and a hosting account. Since WordPress is a content management system, it has tons of features that make publishing content easy. The Built-in blog feature can be accessed from any device so that users need not create one separately. What makes a site to rank high on Google? Searchability is a key to rank high on Google and other search engines. WordPress sites tend to rank high for their keywords because they’re constantly updated. WordPress themes offer multiple choices; most of the themes are instantly available to a new site owner through the WordPress theme directory. The WordPress plugin directory includes hundreds of plugins which are small pieces of code designed to perform specific tasks. Users can also install and purchase 100’s of custom plugins from third-party developers. WordPress themes can be a great choice if you’re looking to refresh your site of new built quality. Multipurpose themes are an amazing way to create something genuinely unique, designs are also diverse and easily playable to achieve the desired results.